The location, the appointment and the service provide. The atmosphere was, as always friendly and service was prompt. Hotel is well Located on Hadrian’s Wall and the facilities downstairs (bar, dining room etc) are fine. Location and views are excellent, added bonus is the use of the leisure facilities, gym, swimming pool, sauna & steam rooms are great for a rainy day. Meals are a good standard and good value for money. Buffet style breakfast was good, but some things can get dried out when standing. You do have the option to have smoked salmon, kippers or gammon and poached eggs to order. On this occasion we stayed room only. Breakfast finishes at 9.30.
very pretty location by the river. Handy to Hadrian's Wall. Easy access. The view outside was beautiful, plus there is a giant chess set you can play with. Location and the views from the bedroom windows are excellent. The garden is well tended but some of the walkways are a bit uneven, raised concrete and cracks. Buffet style breakfast was basic but very tasty. Great, friendly staff, ideal location, very reasonable price, very good standard of food for evening meal. Room had been well thought out with sockets, switches, mirrors etc in the right places. 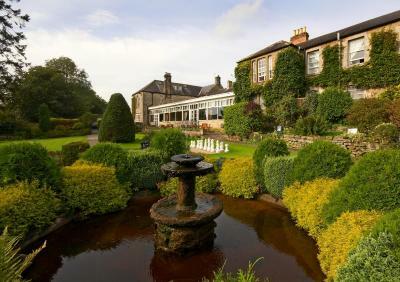 Set on the banks of the North Tyne, in an unrivaled setting overlooking Chester’s Roman Bridge and Hadrian's Wall beyond, this friendly hotel is surrounded by beautiful gardens and spectacular walking routes. Priding itself on traditional ‘northern hospitality’, the George Hotel provides a relaxing environment with open fires, friendly staff and locally sourced and freshly prepared food. The leisure club features a swimming pool, gym, hot tub and sauna, and the on-site beauty and aromatherapist offers indulgent treatments (bookings required in advance). There is also free WiFi access throughout the hotel. Just 5 miles from Hexham, voted Britain's most picturesque market town by Country Life magazine, the George features the perfect place to relax and enjoy a short break. Newcastle Airport is a 30-minute drive from the hotel. This property also has one of the top-rated locations in Chollerford! Guests are happier about it compared to other properties in the area. This property is also rated for the best value in Chollerford! Guests are getting more for their money when compared to other properties in this city. Beautifully appointed rooms, some of which include a river view. Features include a seating area, a TV and an en suite shower room with a hairdryer. This room features a seating area, a TV and an en suite shower room with a hairdryer. This spacious room features a luxurious bed and features a 26-inch flat-screen TV and tea and coffee making facilities. The private bathroom has a bath with an overhead shower and a hairdryer. Most Premier Rooms have four-poster beds and spacious private bathrooms with separate bath and shower. There is a 32-inch flat-screen TV, as well as a seating area and tea and coffee making facilities. This spacious room features a 26-inch flat-screen TV and tea and coffee making facilities. The private bathroom has a bath with an overhead shower and a hairdryer. The whole place needs a massive re-vamp - tired, elderly fixtures & fittings all through the hotel. Pool, hot tub are brilliant but the building in which they are housed is appalling. Changing room has a tarmac floor! Weirdest floor ever! No shampoo, conditioner or body wash in showers which would have been brilliant. The staff. Without doubt they're lovely. Some don't really have a clue but still lovely with it!! The location is utterly beautiful -right beside the river on Chester's bridge Gardens are gorgeous. Hotel is dog friendly and the whole of Northumberland seems to be dog friendly! Food was quite poor. Room floor boards were very squeaky . The whole hotel seem to be unclean excluding the resterant and bar, there were cobwebs all over the place , smeared mirrors and dirty windows and skirting board , the place needs a good decorator , and a newly trained cleaning team . The place has beautifil gardens and grounds though the lesiure facilities / swimming pool and gym left alot to be desired, we went in to an un maned pool which was rusting, falling to bits and dirty! I went to go in the Jacuzzi but the water was so dirty i wasnt prepared to chace it so we left .overall a very dissappointing weekend will will not return, must say the deputy manager was very nice and the place could be made nice with a dam good clean and a decorate . Excellent service from reception, bar and restaurant staff. All went out of their way to be helpful. Breakfast was superb as usual. Surroundings/garden very peaceful- by the river. Excellent value for money and fantastic views of riverside. We stayed here after our walk along Hadrian’s Wall and were disappointed and quite surprised. The room was in need of restoration, it was dated. The grout in the bathroom was black in places and the toilet handle was loose. The lighting in the room was bad. There was only one pillow each. The breakfast was pretty average, buffet style which was not very well maintained. For price it was over rated. Room extremely cold. No hot water in the shower. Terrible value for money. The building is in need of some refurbishment. Our bathroom definitely needed to be pulled out and a new one installed. We had a crack in the basin and the water took a while to fill the cistern. Many carpets are going threadbare. The changing rooms in the leisure centre are in need of updating There aren’t any toiletries in them that I would expect from a 3 star hotel. The service in the restaurant in the evening is extremely slow. The staff were amazing. Very helpful that includes all the staff from receptionist to bar staff , waiters, leisure staff and maintenance. The George is in a lovely setting next to the river North Tyne and some historic sites. Some parts of the hotel such as the grounds were lovely and well maintained. Thank you for the eco bags in the changing rooms. Far too over priced , floor boards are so noisy that when your lying in bed you are constantly woke up to people walking past your room , paid ALOT of money for the superior room which was just a baisic double bed. Feel con’d out of my money for what I got , at least expected a good nights sleep or a bathroom with decent ventilation so that your room wasn’t soaking in condensation !! Food was excellent. Leisure facilities were great after our walk. Hotel was on the Hadrian’s wall path so didn’t need to walk any further. Expensive for what it was. A tired out poorly designed hotel. The leisure facilities were run down and needed items repairing. There was not enough food at breakfast. Had to wait ten minutes to replenish buffet.